Visibly white but legally designated as black, my mother did what the 1924 Virginia state law, the Act to Preserve Racial Integrity, was determined to prevent. In an effort to preserve the "purity" of the white race, this law enshrined the one-drop rule, legally designating anyone with even one drop of African blood as black. A eugenicist at the time expressed the fear emblazoned in the law: "Many thousands of white Negros ... were quietly and persistently passing over the line." My mother was one of them. Gail Lukasik, "My mother passed for white for most of her life. Here's what that taught me about racial identity." Mic, September 12, 2017. https://mic.com/articles/184393/my-mother-passed-for-white-for-most-of-her-life-heres-what-that-taught-me-about-racial-identity. Join us for the opening reception of War Baby/Love Child on Thursday, August 8. Curators Laura Kina and Wei Ming Dariotis will be in attendance, as will exhibiting artists Louie Gong, Richard Lou, Stuart Gaffney, Jenifer Wofford, and Lori Kay. You are invited to the 6-7pm preview and reception program. Light refreshments will be served. Please send in an RSVP to Maria Martinez or call 206.623.5124, ext 107. 7-8pm Open to the public (no RSVP needed). Free admission. This exhibition brings together works by 19 artists, highlighting different approaches to the identities and experiences of mixed Asian Americans, mixed Pacific Islander Americans and Asian transracial adoptees. While their biographies are varied and often diverge from the dominant stereotypes of mixed Asian identities, their lives are shaped by the specific histories of Asian Pacific-U.S. collisions: narratives of war, economic and political migration and colonization. 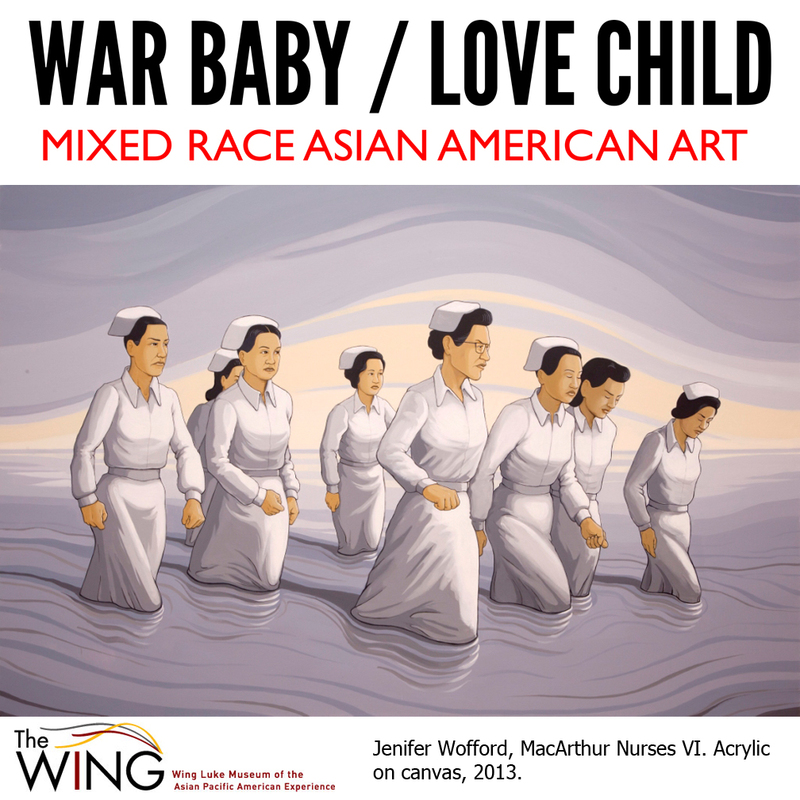 As an ethnically ambiguous Asian American generation comes of age in a world fixated on post-racial politics and moving beyond issues of identity, War Baby/Love Child: Mixed Race Asian American Art examines how artists engage various facets of hybridity in their artwork. Artists: Mequitta Ahuja, Albert Chong, Serene Ford, Kip Fulbeck, Stuart Gaffney, Louie Gong, Jane Jin Kaisen, Lori Kay, Li-lan, Richard Lou, Samia Mirza, Chris Naka, Laurel Nakadate, Gina Osterloh, Adrienne Pao, Cristina Lei Rodriguez, Amanda Ross-Ho, Jenifer Wofford, Debra Yepa-Pappan. CHICAGO — The DePaul Art Museum explores the construction of mixed-heritage Asian American identity in the United States with “War Baby/Love Child: Mixed Race Asian American Art,” which opens April 25. “It gives visibility to the increasingly mixed generation coming of age by highlighting artworks that map personal biography and the construction of mixed heritage Asian American identity against U.S. and transnational histories,” said Laura Kina, exhibit curator. Kina is a Vincent de Paul Professor and founding member of Global Asian Studies at DePaul University, where she also is an associate professor of art, media and design in the College of Liberal Arts and Social Sciences. An opening reception will be held from 6 to 8 p.m. April 25 at the museum, located at 935 W. Fullerton Ave., just east of the CTA’s Fullerton ‘L’ stop. The museum is free and open to the public every day. The exhibition runs through June 30. “Through traditional media as well as video, installation and other approaches, artists explore a range of topics, including U.S. wars in Asia, multiculturalism and identity politics, racialization, gender and sexual identity, citizenship and nationality, and transracial adoption,” said Kina. She co-edited a book of the same title with Wei Ming Dariotis, an associate professor of Asian American studies at San Francisco State University. As an increasingly ethnically ambiguous Asian American generation is coming of age, War Baby/Love Child: Mixed Race Asian American Art looks at the construction of mixed-heritage Asian American identity in the United States. Working in traditional media as well as video, installation, and other approaches, artists explore a range of topics, including US wars in Asia, multiculturalism and identity politics, racialization, gender and sexual identity, citizenship and nationality, and trans-racial adoption. The exhibition features works across diverse mediums by emerging, mid-career and established artists who reflect a breadth of mixed heritage ethno-racial and geographic diversity: Mequitta Ahuja, Albert Chong, Serene Ford, Kip Fulbeck, Stuart Gaffney, Louie Gong, Jane Jin Kaisen, Lori Kay, Li-lan, Richard Lou, Samia Mirza, Chris Naka, Laurel Nakadate, Gina Osterloh, Adrienne Pao, Cristina Lei Rodriguez, Amanda Ross-Ho, Jenifer Wofford, and Debra Yepa-Pappan.